By the 1970s, it was common practice for marine mammals, specifically orcas, to be forcibly captured from their home in the ocean, taken from their families, and placed into captivity for entertainment. Although SeaWorld and other marine parks have made advancements in the sizes of the pools orcas are kept in, they’re still, quite literally, the size of a bathtub in comparison to what they would experience in the wild. A captive setting can never recreate their natural environment, and this includes SeaWorld’s recent unveiling of their design for a new orca habitat. The extent to which orcas are allowed to live their lives in captivity is extremely limited; to acknowledge and understand this and yet continue to breed them and train them to perform for profit is inherently cruel. We know now, more than ever, that orcas are incredibly social and intelligent beings. Considering the significant lack of stimulation and enrichment these animals receive living in concrete tanks, it shouldn’t come as a surprise to us that we have seen a number of tragic incidents involving aggression illness and, occasionally, death. 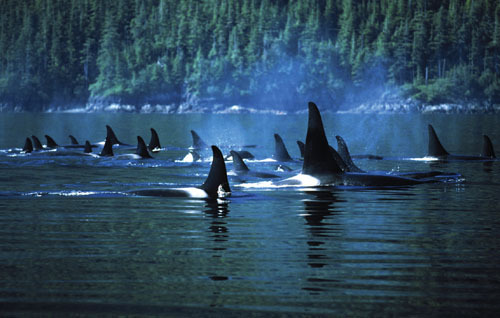 In the wild, orcas live in pods with kin from various generations. These pods can range from a few individuals to a few dozen members. A calf will remain with its mother for at least two years while it learns to hunt, but many choose to stay with their family for life, leaving the pod only to breed. In captivity, these families are no more than artificial social groups that SeaWorld and other marine parks can modify at their leisure. SeaWorld has repeatedly removed calves from their mothers at an early age. Instead of acknowledging this, SeaWorld representatives have defended their actions by stating that orcas are only separated when they’re disruptive to their mothers or to maintain a healthy social structure. The truth is, the separation of a mother and calf is a traumatizing event for an orca of any age. Female killer whales reach sexual maturity and begin breeding when they’re approximately 15 years old. Based on long-term studies of wild orca populations, the gestation period is typically 13-17 months, with females giving birth every three to five years. SeaWorld has bred their orcas through artificial insemination for years. Males are trained to remain on their backs as trainers collect the sperm that will be used to impregnate the females whenever needed. Most notably, SeaWorld has repeatedly bred females at an incredibly early age. Many of these females were ripped from their own mothers at a young age and have no understanding of how the mother/child relationship should be. This lack of maternal experience, along with the stress of their environment, has lead a number of captive female orcas to reject their calves in captivity, a phenomenon rarely seen in wild orcas. In the wild, orcas can travel up to 100 miles in a single day. In the oceans, these powerful creatures can dive up to 200 feet and spend most of their time deep under the water’s surface. In captivity, they’re not allotted that luxury. Confined to a small pool, an adult orca would have to circle the perimeter of their tanks 1,900 times to swim the same distance they would in the wild. This lack of movement is what scientists today believe is a driving force behind dorsal fin collapse in captive orcas. Seldom seen in wild orcas, dorsal fin collapse can be witnessed in practically every captive male orca. In the wild, whales spend time with their families traveling, hunting and playing together. Wild whales are seldom “bored” or in need of mental or social stimulation. In captivity, SeaWorld emphasizes they provide exceptional mental stimulation for their orcas. Unfortunately, the most enrichment or stimulation the whales receive is the few hours they spend daily performing during shows. For example, you can see what Tilikum has been up to during his downtime here. SeaWorld has consistently used a manipulative play on words to indirectly make the consumer believe their animals are content. However, documents that surfaced last year revealed SeaWorld was administering benzodiazepine drugs to their animals to ensure the stability of their mental health in captivity. Although other aquariums have admitted to using similar practices, we have to wonder: If the animals need to be given psychotropic drugs to remain calm, are they really content in captivity? Wild orcas form strong social bonds with members of their pods that can last for the duration of their lifetimes. Pod members follow a sort of code that prohibits serious violence towards one another. While they can have oppositional relationships with other orcas, as Tim Zimmerman points out, wild orcas have the ability to remove themselves from these situations by simply swimming away. In captivity, however, orcas from different ponds and regions of the world are forced to live in a tub together. This understandably leads to some inter-orca conflict. In tanks, there is nowhere to hide from others. As a result, many captive orcas have “rake” marks, cuts that are caused by another whale dragging their teeth across the other’s skin. Ouch. Although this is not an abnormal behavior, the level of aggression in captive orcas has caused a number of severe injuries. Captive orcas not only exhibit aggression toward one another, but towards humans as well. There are zero documented cases of an orca whale attacking a human in the wild, yet at SeaWorld alone, there have been over 100 “incidents” involving orcas and trainers. The average life expectancy of orcas in the wild can vary somewhere from 50 to 80 years, with females generally outliving males. In May of 2014, a 103-year-old female orca was spotted off the Washington coast. SeaWorld shamelessly manipulates information on their website regarding the life span of wild orcas. They conveniently disregard the 30+ years of research that a number of established groups compromised of scientists and biologists have acquired of wild orca populations and instead opt to acknowledge their own research, which is in large part irrelevant to wild orcas or outdated. While SeaWorld makes mention that they have several orcas in their 30’s and are quick to note the mortality rate of some wild killer whale populations, they neglect to disclose records of the dozens of orcas who have died in captivity in their care and at other marine parks before they’ve barely reached sexual maturity. Given the exceptional level of veterinary care and environment these facilities pride themselves on, should it not come as a surprise that they have whales dying at early ages from seemingly preventable incidents including physical injury disease and bacterial infections? What Can You Do to Stop Captivity? Today, we live in a society that recognizes the complexity of these animals on a social and emotional level, and yet we continue to pass off their exploitation as education and conservation. Future generations need to be taught to respect and preserve these animals, not how to manipulate them for a profit. If you’d like to experience these magnificent marine mammals in their natural environment, in a way that doesn’t inhibit them or cause them stress, look into a whale or dolphin watching cruise. Most importantly? Don’t buy a ticket to any park or business that keeps marine mammals in captivity. I love the first picture. This is where all orcas should be (\’Early Development\’).